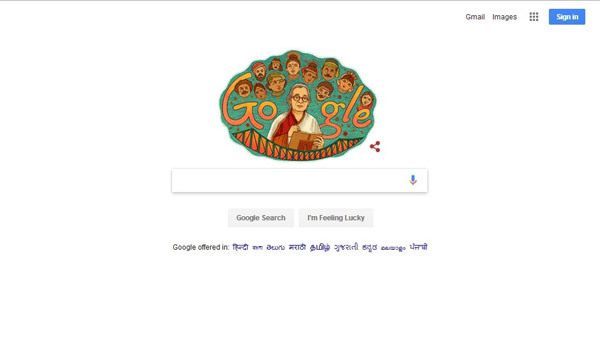 Search engine Google on Sunday dedicated its doodle to noted author and social activist Mahasweta Devi on her 92nd birth anniversary.Born on January 14, 1926 in Dhaka in present day Bangladesh, Mahasweta Devi was a Bengali fiction writer who was honoured with various literary awards such as the Sahitya Akademi Award (Bengali), Jnanpith Award and Ramon Magsaysay Award along with Padma Shri and Padma Vibhushan. She died on July 28, 2016 in Kolkata.Some of her famous literary works include "Hajar Churashir Maa", "Rudali" and "Aranyer Adhikar".Mahasweta Devi wrote over 100 novels. Her first novel, "Jhansir Rani", based on the life of Rani of Jhansi Lakshmibai, was published in 1956. In 1997, she was awarded the Ramon Magsaysay award in journalism, literature and creative communication arts. She was also awarded the prestigious Ordre des Arts et des Lettres (Orders of Arts and Letters) in 2003 for her contribution to literature.